Small wrinkles/lines below 0.25 mm practically disappeared after the treatment. Wrinkles deeper then of 0.25 – 0.27 mm were flattened to the limit of about 0.25 mm depth independently of their initial depth. The deeper the wrinkle — the higher the flattening effect. Those with 0.35 mm depth were "ironed" only by about 29%. 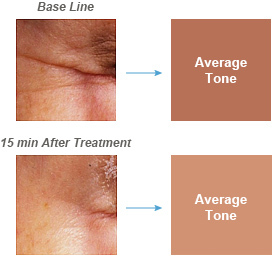 There is a rapid reduction of the wrinkle depth right after the Recover treatment in a matter of 10 – 15 min. 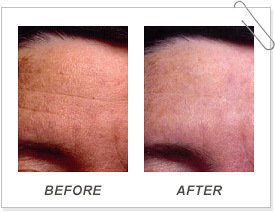 The maximal effect is achieved in about 1.5 – 2 hours after the treatment. The high level of the wrinkles depression is effective for about 4 hours. 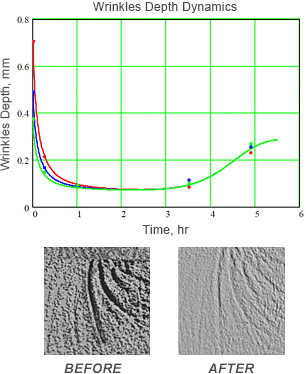 The wrinkle depth dynamics become independent of the initial wrinkles' characteristics after about 2 hours after the procedure. There is no complete wrinkle restoration after more then 5 hours, and our estimation, supported by some measurements, even after 24 hours, which means that some wrinkle reduction effect is permanent. The residual wrinkle depth is the same for all the wrinkles in the area and is about 0.25-0.27 mm. It probably corresponds to the equilibrium state between the Nano-particles network elasticity properties and the local mimic muscles activity (mechanical stress). Click here to see Recover results from real people.